WE LOVE COLLABORATIONS - As an Interior Designer, Mari is always sketching elevations & ideas for her clients. Her colorful Mood Boards displayed on her Instagram & Facebook feed have received attention from bloggers & designers all over the world. Many wonderful Collaborations have resulted from these relationships. Is your project next? This is one of the products I had fun illustrating for Pottery Barn. Hopefully you'll be seeing a few more of the ones I worked on upcoming in 2016. BTW Nicest people EVER to work with! Super excited about my collaboration with Eccolo Ltd. to create products for Home Goods, Home Sense, TJ Max & Marshall's. Also available in my shop! I love TOSS Designs and I'm thrilled to collaborate with them! 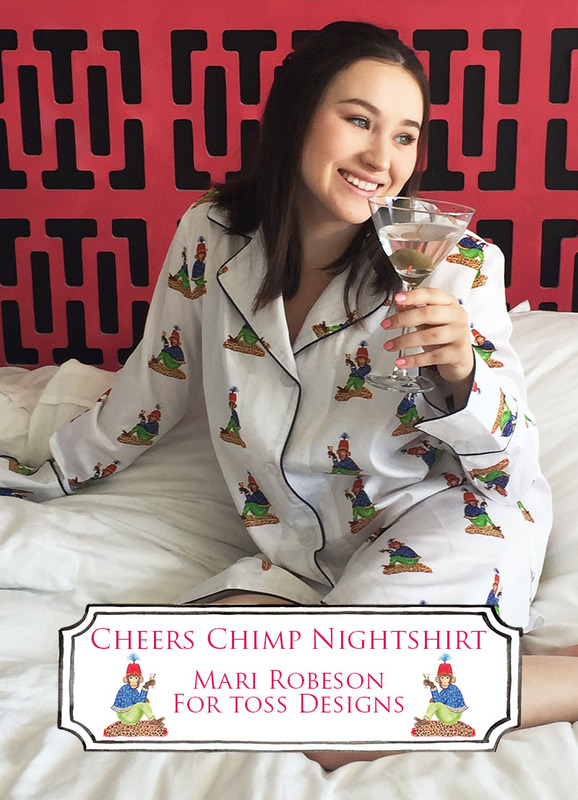 This super soft, sateen Night Shirt has my cheeky little chimp, Marcel, sipping away, celebrating life! Available nationwide and in my shop! Lola Home is a Brazilian Home Decor company I created several watercolors for that they then applied to table top and pillows. Also just a delight to work with!! These prints & notecards were created from vignettes designed by the very talented, Interior Designer, Hillary Thomas & are available for sale on her website. ILLUSTRATIONS FOR BLOGS & BOOKS - Want to add a little color & fun to your blog or next book project? We’d love to hear about it!!! These are just a few examples of collaborations with bloggers. Free Wall Paper Downloads for their readers. If you're a blogger interested in offering this to your readers, contact us!